Gone are the days when a mint on the pillow and fresh flowers in the room were all it took for a hotel to win its guests’ loyalty. Today’s travelers aren’t so easy to please. The millennials, who are expected to be one of the largest hotel spenders, desire an exceptional, personalized travel experience that meets their digital needs as well. Hoteliers today are looking at both leisure and business travelers who are digitally immersed and expect – nay, demand – uninterrupted and free access to the Internet. For those traveling for work, business centers in the traditional sense have become redundant and have been replaced with a fast Wi-Fi connection, as most guests prefer accessing the Internet from their personal devices. Secure wireless access is also non-negotiable for hotels that host meetings, conferences and conventions. For those traveling for pleasure, giving their friends and family an up-to-the-minute lowdown on their trips is de rigueur. These very social media reviews hang like a sword over property owners’ heads, too. A simple thumbs-up or -down could mean a swing in the sales curve. Providing fast Wi-Fi is the first step to getting great reviews. It’s a given, then, that today’s digitally savvy customers expect the same easy-to-use Wi-Fi capabilities that they have at home or work. They expect to stay connected, listen to music, watch movies and have a constant presence on social media. More astute hotels are now going a step further and offering digital perks, such as personalized services using Wi-Fi, to stay relevant in a hugely competitive market. When it comes to pampering the guests with personalizations, the possibilities are endless. Airlines have already been doing it, but hotels, too, now offer mobile check-in so that all guests need to do when they walk in is grab the keys or, better still, use their mobile phones for a keyless entry. They can use their smartphones to access facilities such as fitness rooms and spas and can order room service at the touch of a button, with the app going a step further and prompting past food preferences and allergies. How’s that for personalized service? In the guests’ rooms, the TVs can provide both entertainment and essential services. With rapid growth in personalized technology, Television 2020 will see everyone connected to a smart TV. In fact, content delivery networks will carry over half of Internet traffic by 2019. Major disruptions to traditional TV and home entertainment mediums have given rise to “Cord Cutters,” a term used to describe those who forgo television subscriptions in favor of an Internet-based or wireless service. What this boils down to is people wanting the easiest access to content wherever they happen to be. Hotels can connect their TVs to the Internet, but that works only if Ethernet wiring already exists. For a majority of hotels that still use coax cables, this could mean a substantial investment in upgrades before they can reap the benefits of smart TVs. Instead, thanks to the advancement in TV technology, TV sets now come with a built-in modem that can offer the same range of facilities as a smart TV by using Wi-Fi connectivity. Using the smart TV controls, the guests can check-out from their rooms, saving precious time otherwise spent at the hotel’s reception area. They can control lighting and temperature in the rooms and, of course, watch movies and TV shows. In addition to being able to access the interactive program guide, the guests have the ability to stream content from their mobile devices. Showing customized content based on the guest’s special interests can help win a customer’s loyalty. Hospitality TVs come with their own content management solutions that are boons for property managers who can manage multiple TVs from a central location, making installation and maintenance a breeze. These personalizations not only provide memorable services for guests but also make the hotel more efficient and allow it to save on operational costs. In the coming years, seamlessness in the guest experience will not be just a trend but a necessity. Hoteliers who truly understand this and upgrade will be the ones who stay ahead of the curve. Innovations such as these are going to be a part of the world’s largest and oldest hospitality technology exposition from June 26-29, 2017. The Hospitality Industry Technology Exposition and Conference (HITEC®) , produced by Hospitality Financial and Technology Professionals (HFTP®), brings together the latest industry products and services from over 300 companies. The four-day event attracts the brightest minds and hottest technologies from across the globe and offers exhibitions, tech-talks, education sessions and technology showcases, not to mention several opportunities to socialize and network with fellow professionals from the hospitality-tech field. Historically hosted annually in a different city within the United States, HFTP decided this year to break tradition by hosting three HITEC events outside the United States in Toronto, Amsterdam and Dubai. 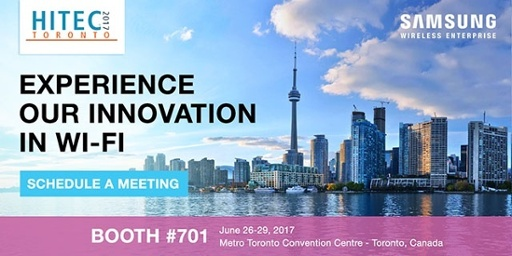 Come to the Samsung Hotel at booth #701 and experience our innovative hospitality solution that provides dedicated Wi-Fi network for every guest, cloud-based unified communications, and connected digital screens to help you enable greater guest experiences and improve your customer satisfaction score.